I hope that translations for other languages also will be ready to Release date. Current translations can be downloaded from GitHub. where can i download the last gliden64 plugin? Exellent work Gonetz! When they release this update? There will be another pre-release? The last you have published is very old ..
New Public Release planned to be out this year. 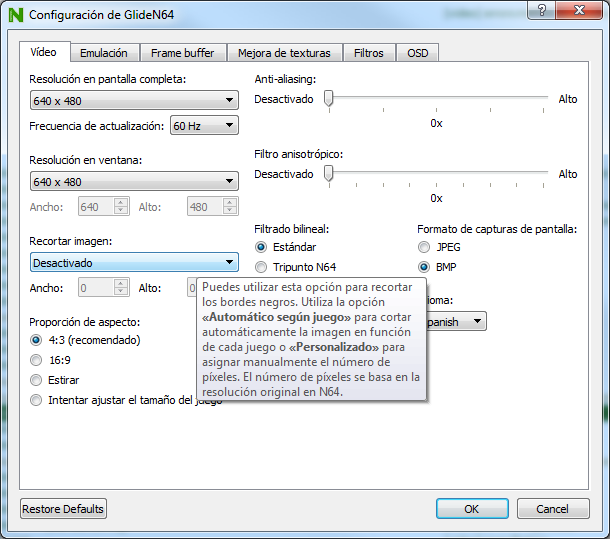 But Gonetz, is it possible to recover the "Force Bilinear Filtering" feature from your previous Glide64 plugin? Some sprites, like the Super Mario 64 text or the GoldenEye ammo icons, don't use any kind of bilinear filtering because they are rendered on native resolution (on console) so when you upscale them to high resolutions they look too blocky and pixelated. I think having those gigantic pixels really hurt all the graphical improvements you have introduced. Don't take me wrong. I love your work and dedication. Can you at least tell me why the feature isn't available anymore? 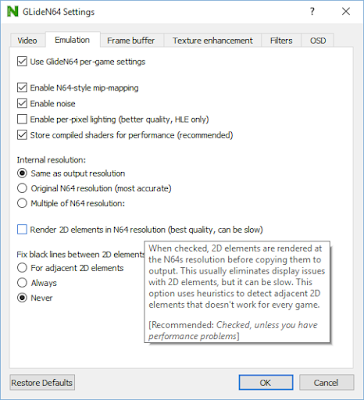 "Force Bilinear Filtering" feature is not planned. You may use texture filters from texture enhancement module. Do those filters act on the sprites I described? Because in the current GlideN64 public release they don't. "Force Bilinear Filtering" worked on them in GLide64, that's why I'm saking. Yes, the filters applied to all textures unless you selected "Disable for backgrounds" option. However, result may differ from standard bilinear filtering. I did not pay much attention on that module; some algorithms may need updates. Ummmm, How do you use this plugin on PJ64?